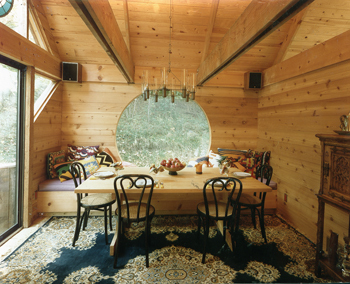 William Trout had a cause: the smaller home. 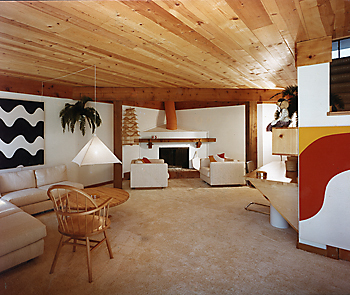 Though he designed a 37,000-square-foot “winter bungalow” in Vail, Colorado, for the Shah of Iran’s finance director, he preferred the more modest assignment: Something like half the homes for which Trout created the original design and blueprints contained no more than 1,600 square feet of floor space. In fact, he saw this work as his personal mission. The “ticky-tacky little boxes” that lined the streets of subdivisions were every bit as unacceptable as dull public buildings. 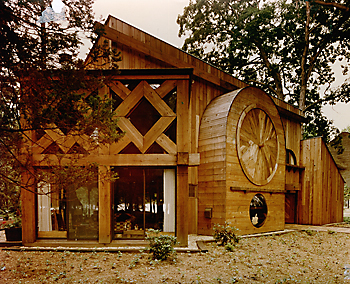 A bland-looking structure may take only a few weeks or months to design and erect, Trout argued, but it “takes society years and years to get rid of that thing.” He felt even worse for the families that settled for such an abode when they could have had something so much more, well, nourishing. 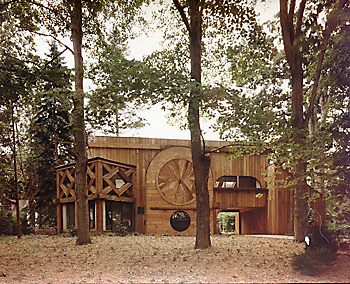 Born in Cleveland in 1935, Trout was pursuing studies in sculpture at the Cleveland Institute of Art when he wandered one day into an architectural exhibit at nearby Kent State University. The scale of the work thrilled him, as did the idea that people would be living in it. 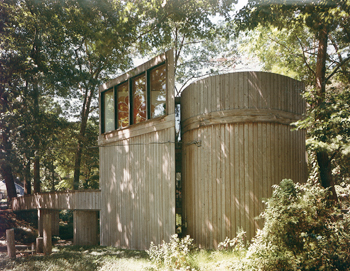 He knocked on an office door and asked, “How do I get into this place?” It was his skill as a diver that would pay Will Trout’s way through KSU; but by graduation in 1961, his impressive designing had earned him the opportunity to polish his craft at the elbow of such eminent local architects as John Terence Kelly and William B. Morris. In 1966 Trout opened his own firm based in the western suburb of Rocky River. Among the early commissions that were to make his name were the William G. Moore home (Moreland Hills), Joseph Heinen home (Chagrin Falls) and Richard Schubert home (Bay Village). Later clients would include then Lieutenant Governor Richard Celeste and Cleveland Indians pitcher Gaylord Perry—but also (Trout proudly noted) a policeman, a widow and a telephone repairman. 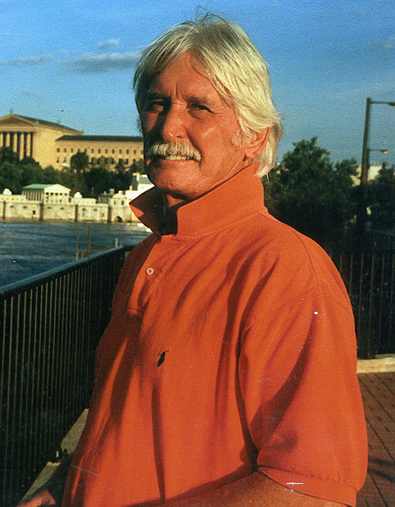 National recognition of the Landings condominiums he designed for Avon Lake led to important out-of-town commissions and the opening of branch offices in Vail Colorado, where the family moved into a log cabin built in 1869, and Seattle. 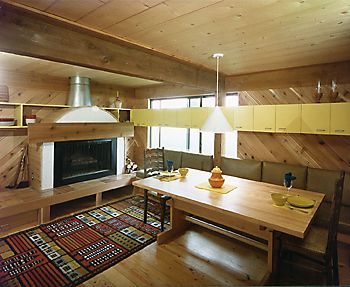 Trout resonated with the aesthetic and feel of the mountain lodge, instinctively shunning such then popular building materials as rubberized vinyl brick and wood grain Formica in favor of natural materials. 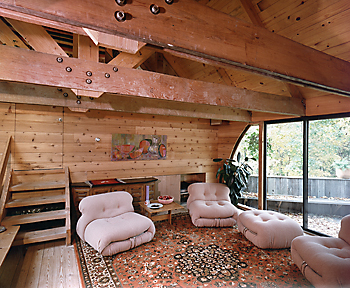 The home he designed for himself and his family featured exposed walls of sealed smooth-sawn cedar with factory-applied stain and preservative, white pine floors with a polyurethane finish, support posts of 12” x 12” mine shaft timbers, ceilings of Alaskan white pine, beams of rough-hewn cedar and a roof of hand-split cedar shake. 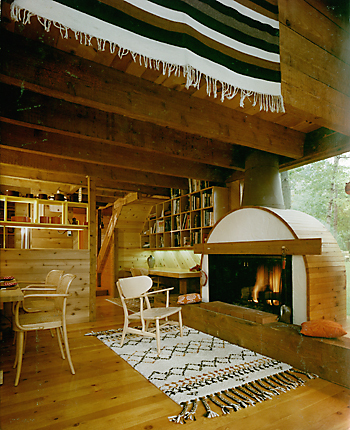 Trout juxtaposed wood horizontally, vertically and diagonally to create visual excitement, hung bright fabrics against natural wood, and gave his designs evocative names like Rainflower, Songbird, Wildflute.